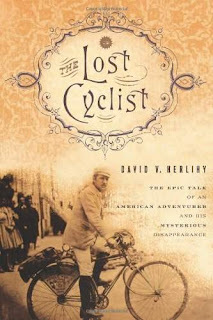 Author David Herlihy will be in Northeast Ohio on Wednesday, November 3, for a book signing and discussion of "The Lost Cyclist: The Epic Tale of an American Adventurer" at 7:00PM at the Joseph-Beth Booksellers at Legacy Village in Lyndhurst. A slideshow will accompany the discussion. In "The Lost Cyclist," Herlihy recounts the story of Frank Lenz, a young man who left his home in Pittsburgh in the spring of 1892 to cycle around the world on a new-fangled "safety" bicycle (the modern prototype), only to disappear mysteriously two years later in eastern Turkey. Bringing to light a wealth of information, Herlihy's gripping narrative captures the soaring joys and constant dangers accompanying the bicycle adventurer in the days before paved roads and automobiles. BICYCLE DIARIES, by David Byrne (Penguin, $16.) Byrne — singer, composer, former Talking Head — has been a serious bicyclist since the early 1980s, and he takes his full-size folding bike with him all over the world. This account of his travels at home and abroad “is partly about cycling but also about whatever Byrne happens to have on his mind, . . . and fortunately a lot of it is quite interesting,” Geoff Nicholson wrote in the Book Review. 2011 road bikes are hot! Westlake wants YOUR input as a bicyclist! Night Ride Update: Beer Tapping, Prizes, Sausage! Luna Sport Fall Collection Now Available! Best Bike Shop in Cleveland! Interbike 2010 Report - Electra, etc. Interbike 2010 Report - Shoes, Racks, Bags, etc.